Designing effective professional development for teachers is no small order. As many technology integrationists can tell you, teachers can be the worst students. In order to have an impact, your lessons must be relevant and engaging. Sound familiar? 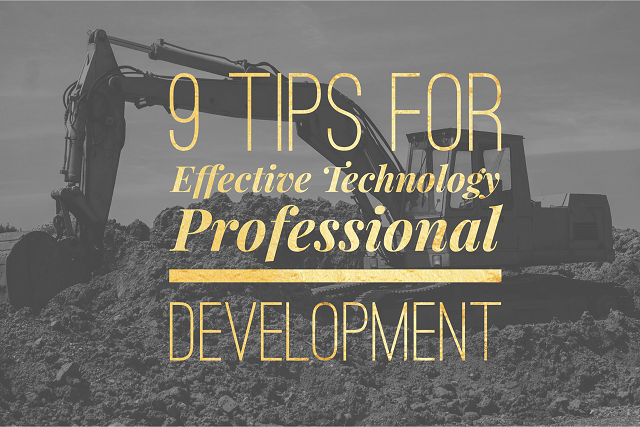 Here are nine tips to creating effective professional development sessions. Effective professional development is personalized. It’s crucial to know who you are teaching to and what they’re skill level is. You’ll want to design your session to fit the skill set of the people in the room. A simple survey can go a long way toward helping you create a meaningful workshop. Prior to the meeting, send a short three question survey to everyone you expect to attend. The survey should include a question or two to gauge their level of knowledge in the application or tool as well as an inquiry into what they hope to learn during their time with you. Adjust your teaching outline based on what you learned from the survey. Teachers need to have a clear expectation of what they will be learning. The objective of the lesson should be well defined. For example, telling the group they’ll be learning “Google Forms” is vague. Instead, explain what the technology is and how they can use it. A better description to your audience would be “Using Google Forms to Collect Summative Data in Your Classroom.” Your session attendees receive a clear, focused explanation of what they can expect to learn. Make sure that the topic of your professional development session is aligned with the long term vision of the school district. Too often these workshops are focused on the latest trend in education. Select topics that are associated with where the district is headed as it relates to technology. Be sure to let your audience know how this session is integrated with the overall plan. This one I see all too often in professional development sessions. I know I’ve been guilty of this myself. Here’s the scenario: The instructor goes to use a tool or demonstrate a feature and it doesn’t work because the application has changed since the last time they taught this lesson. Confidence in both the software and the instructor is immediately put in question, not to mention that the session outline is thrown off track by this unexpected bump in the road. Web apps of today are not like the traditional software packages of the past. These apps change, update, and add features on a regular basis without much notice. When you know you’re teaching a lesson, be sure to run through the application prior to the start. Five minutes of prep work can make a huge difference in the success of your session. One of the most effective ways to engage teachers is to structure your session around creating a real lesson they can use in class. Making a sample assessment is good, but building an actual assessment is outstanding. A great way to ensure success is to ask participants to bring a worksheet or lesson with them from their classroom. Teachers constantly struggle with finding the time to learn new technologies. By building a session with their lessons and worksheets in mind, your audience will walk away with something that they can immediately use in their classes. This is time well spent! Additionally, the satisfaction of a small “win” with that technology will likely push them to use it again. Another key to truly effective professional development is time. It is a constant battle to find time to work with new tools so it is critical that you provide time during your session to allow people to practice. Everyone needs time to work through the skills that you’ve just taught. Even the most tech savvy teachers like some time to tinker with whatever new tool or ability you’ve shown them. This gives the audience time to run through ideas they may have and in return, voice any questions or concerns they may arise. Use the technology you have at your disposal to record your presentations. This is a fantastic way to begin building an in-house library of professional development content. Additionally, those who attend the session can look back on what you did and exactly how you did it. You can use a screen capture tool like Screencastify to record your voice as well as your screen. You can even choose to embed video from an external webcam into the lower right hand corner as well. Taking it a step further, use a tool like EdPuzzle to embed questions into the video then analyze the response data as a way to improve your teaching style. Recording your sessions is a no hassle, free method to take your professional development to the next level. The teachers who take this back to their classroom need to feel supported. You’ll want to provide your audience with all of the resources they can go to for ongoing support. This can be something simple like who they can email with questions or it can be much more in-depth like an online library of help videos. Whatever the method is, make sure your teachers know they have a place to turn to for answers. As you conclude your session, ask your participants to fill out a short feedback survey. The survey shouldn’t be more than five questions. You’ll want to give them the opportunity tell you what they liked about the lesson, what they didn’t like, and how you could refine your presentation. I recommend you make the survey anonymous to encourage honest feedback.